On August 21, the path of totality of the “Eclipse Across America” will pass directly over two OOI Coastal Endurance Array Surface Moorings, adjacent to one, and close to three others. These moorings will “see” the eclipse minutes before it is seen from the mainland. These moorings are part of the long term monitoring infrastructure of the OOI, and were not specifically designed for the eclipse. Being present in the ocean 24/7 through the OOI infrastructure allows scientists to be at the right time in the right place, at no additional cost. It enables anyone with an internet connection to download data and study once in a lifetime events, such as the eclipse, volcanic eruptions, rogue waves and many other episodic events that can greatly impact our planet. We are lucky to be in the narrow path of totality and are excited to share the eclipse data we will be collecting in real time with the community. Several existing sensors on the OOI moorings will provide unique insight of the impact of the eclipse on the coastal Oregon environment. These include measurements of sunlight (shortwave radiation), air temperature, water temperature, and movements of creatures within the water column (bio-acoustic sonar). These measurements are described below and displayed in graphs that will be updated daily. Additionally, in preparation of the eclipse passing over these moorings, the OOI Data and Engineering teams have increased the sampling rate of the two bioacoustic sonars along the eclipse path to be able to catch changes in movements of organisms in the water column during the brief time of the eclipse. Reduced sunlight will reduce the rate at which the sun warms the air in the morning. During previous eclipses air temperature has dropped several degrees. Air temperature measured a few meters above the ocean surface by our mooring will be moderated by the ocean water, so it will likely change a lot less than air temperature over land at the coast. Water temperature measured on the bottom of our buoys (~1 m down) is likely to change by much less than the air temperature during the eclipse, but we might see something, so we are plotting these data too. 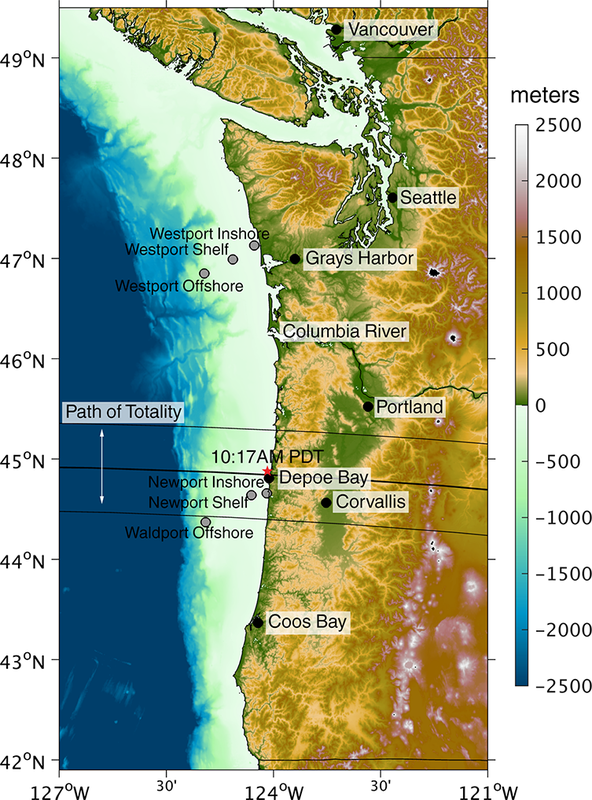 The OOI Oregon Shelf Benthic Experiment Package, which houses the bioacoustic sonar, is connected to shore via a fiber-optic cable, so all of its data are available in real-time and it can sample continuously. This instrument sits in a frame on the seafloor looking up from 80m depth. Download raw data from this bioacoustic sonar in near-real time. A second cabled bioacoustic sonar is mounted, looking upward, on the 200m Platform of the Oregon Offshore Cabled Shallow Profiler Mooring. The mooring is located along slope at the edge of the continental shelf in 600m of water. The Shallow Profiler on the mooring goes up near the surface and back down to the platform 9 times a day. One can see the profiler’s path in the backscatter data. As with the Benthic Experiment Package, the Shallow Profiler Mooring is connected to shore via a fiber-optic cable. The 120 kHz transducer of this bioacoustic sonar sends longer wavelength sound waves than the 200 kHz one, so it preferentially receives stronger backscatter off larger objects. The 38 kHz transducer of this bioacoustic sonar sends longer wavelength sound waves than the 120 kHz one, so it preferentially receives stronger backscatter off larger objects. Bioacoustic Sonars are also located on several Endurance Array surface moorings, but these sensors are battery operated and not cabled to shore. As a result, they sample less frequently and are able to only telemeter a small fraction of their data to shore every day. All of their data will be placed online after the instruments are recovered this October. Content on this page was derived from a webpage created by Craig Risien, Chris Wingard, and Jonathan Fram, who work on OOI at Oregon State University. Oregon State University operates and maintains Coastal Endurance Array moorings and gliders for the OOI. The University of Washington operates and maintains cabled benthic packages and moorings on the Coastal Endurance Array as well as other cabled OOI infrastructure.